TV One’s popular drama serial, Mein Sitara, serves as a window into a glitzy world of showbiz where behind the flashlights of paparazzi cameras are hidden several gut-wrenching tales of aspirants who dreams to make big in tinsel town. Originally titled as Nigar Khana, Mein Sitara aired in two successful seasons on TV One. It narrates Suriya’s journey to stardom - although she can’t make to the top of the film industry but her struggle shows us the dark side of the glamorous world. It is true that glamor holds irresistible attraction but with it comes pain, miseries, physical and mental exertion. The acclaimed scriptwriter, Faiza Iftikhar, has worked on this risky idea in Mein Sitara and crafts a story that touches hearts with its captivating plot, relatable characters and power-packed performances of seasoned actors. The drama leading lady, Sitara, is shown as a strong-willed woman sans any clichéd characteristics of small screen typical heroines. Unlike the teary-eyed miserable female lead of TV, she boldly takes steps in life and always ready to face the consequences. Her inner strength serves as the valuable tool to overcome obstacles life throws at her. She responds to situations quite naturally - after a setback in career, she doesn’t give up hope and fight circumstances with vigor. The dynamic duo of writer-director has worked diligently to make the characters as realistic as possible. The names of the characters have been astutely chosen to correlate with the story - Jharna gives a new identity to Suriya by giving her a name Sitara – she wants to see her as a rising star of the showbiz world. The ambitious Sitara calls her daughter Falak because she thinks that there shouldn’t be any limit to her daughter’s talent. The director, Seema Tahir Khan’s wonderful execution of a fascinating tale not only covers the struggle of an aspiring actress but it also gives valuable insight into mannerism of yester year film arena. 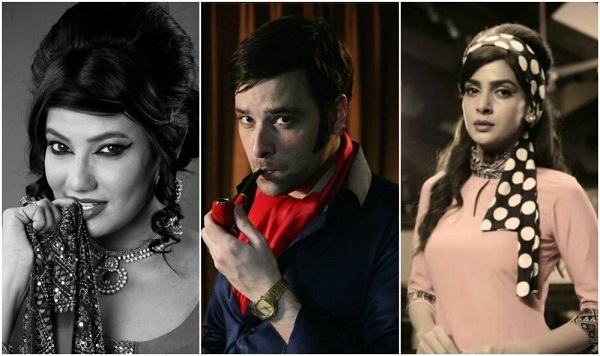 Set in a golden era of Lolly wood, Mein Sitara is a brilliant depiction of filmi dunya from mid-sixties to its downfall in the 80s till the emergence of television industry at the turn of the century. The drama beautifully exposed the bad practices that have clamped showbiz world since inception – be it casting couch culture, inevitable insecurities of celebrity couple or existence and influence of ‘dancing girls’ from the questionable background in the industry. From the setting, costumes to attitude everything aptly depicted the era the story belongs to. Jharna’s puffed-up hairdo, Sitara’s winged eyeliner, and FarhadSethi’s bell bottoms pants and silk scarves, all reminded us of stylish era of the 60s. Sitara is a reflection of film star Rani’s life story whose father was a driver and she was adopted by singer Mukhtar Begum. The celebrated couple of Jharana and Farhad Sethi also reminded us of many showbiz couples of yesteryears including Muhammad Ali and Zeba, Sabiha and Santosh and Robin Ghosh and Shabnam. We have seen several women-centric stories on the small screen but Mein Sitara is a notch better than the rest presenting multi-dimensional characters in a well-knitted riveting tale. Characters are etched with precision and there isa logic behind every move they make in the drama - be it Sitara’s marriage bargain deal with Ilyas Khawaja or her decision to take revenge from him by letting her daughter work in his production house. The characters are neither holier nor painted in the darkest shades of black – in fact, they are well-crafted with a sense of realism and nuanced personalities. The director, Seema Tahir Khan, has done a splendid job in handling a complex story and managing multi-star cast with ease. The supporting actors are not added in the story just as fillers but each one of them an interesting story attached to their backgrounds. In the beginning of the first season, no one has ever imagined that a small appearance of Adnan Shah Tipu as make-up artist Pappu will become such an integral part of the script in the second season. Film star Meera has once again surprised us with her power packed performance as a nasty Naseem Dilruba. While the promising act of Meekal Zulfiqar and Aisha Gul has been the highlight of the first season, the spellbinding act of Noman Ijaz in the second season has hooked viewers till the last. Mein Sitara is not only about the rise and fall of the film industry but also exposes the bitter reality of showbiz world by showing that how actors make a compromise stay in the business. Sometime they have to crush their souls to run their kitchen. The time comes when Sitara’s life gets completely shattered but like a warrior she bounces back after every setback. When Naseem Dilruba threatens her to destroy her career on theater – at first she gets frightened but then composes herself and outclasses her in stage performance. With the downfall of industry, Sitara’s hopes to earn name and fame also get dusted. She compromises on her dreams just to make her daughter’s life comfortable - she works as an extra in industry, gets associated with voice over industry and even agrees to do an old aged character on television. Kudos to Saba Qamar who enlivens a coming-of-age character with an engrossing act. She has worked really hard to make this role as real and depth as possible. With oodles of talent, she wonderfully portrays different phases of Sitara’s life – from an innocent teenage maid, a beaming starlet, a financially-stricken theater performer to a doting mother. The first season was all about the glorious period of the 60s when cinema was at the height of glory. Everyone’s dream to become a film star – and young Surya was no different. She adored stars, lived and breathed films. She wanted to become a shining Sitara of showbiz world – and her mentor Jharna Begum (ex-singer) helped her achieving her dreams. Although Jharna’s husband (FarhadSethi(actor turned producer) cast Sitara in his upcoming film but some unfortunate circumstances never let her dreams fulfilled. The conspiracy of the small-time starlet, NaseemDilRuba smashed Sitara’s career before it took flight. FarhadSethi’s interest in Sitara further deteriorated the situation – it also affected the bond between Jharna and Sitara. As Sitara doesn’t want to hurt JharnaBaji she doesn’t reciprocate to Farhad’s feelings and he suffered from a severe mental disorder. In a hurry to make things better, Sitara marries Jamal (co-actor). Due to Naseem Dilruba evil’s intention, the relationship of Sitara and Jamal didn’t go too long and ended up in divorce. A bad patch with Jamal further destroyed her career. In order to make both ends meet, she started performing in private dance parties. Renowned filmmaker Ilyas Khwaja spotted her at one such occasion and took her with him. He promised her to give a big break in films but in reality, he started using her to earn his vested interest by forcing her to perform in parties of high-profile socialites. Sitara’s dream to be a big star badly collapsed when Ilyas Khwaja ditched her. The pregnant Sitarawent on roads, and her friend Pappu helped her in tough times. The birth of Falak gave a new direction to Sitara’s life. She once again gathered smashed pieces of her heart and started making effort to provide a decent life for her daughter. She even sent her to boarding school to keep her away from the dirty world of showbiz. Times passes and a teenager Falak returned with an intention to make a career in film industry. At first, Sitara strongly opposed the idea of Falak making a foray into film world but later she agreed to see the interest of her daughter. The path of IlyasKhawaja and Sitara crossed again when Falak gets a job offer from her father’s production house. Although Falak turned down IlyasKhawaja’s offer but Sitara insisted her to join his team. What is the motive behind Sitara’s decision to send Falak to IlyasKhawaja? Does she want to take revenge from IlyasKhawaja by using her own daughter? What will happen when Falak get to know about her relation with Ilyas Khawaja? What attracts Ilyas Khawaja towards Falak? To know this and more, watch the last episode of Mein Sitara this Thursday only on TV One.